React was developed by Facebook in 2011 and given open-source status in 2013 under the controversial BSD3 license. Since its first release, React’s Github repository has generated 96,000 stars from developers and has amassed a community of almost 1200 active contributors, regularly pushing updates to enrich the library. With over 7M downloads in the month of May alone, this library has definitely proven its preference within technology companies. Businesses were quick to grasp this technology because of the simplicity it offered to developers; that is, the ability to learn React in bare minimum time. Code reusability with hassle-free addition/modification of functionalities in the existing system meant allocating significantly less time and budget on development and building larger teams, respectively. Top companies are truly enamored by React’s capabilities on a business stand point. The list of companies utilizing React in production is there to prove it, just to name a few: Facebook, Instagram, Netflix, Whatsapp, Salesforce, Uber, The New York Times, CNN, Dropbox, DailyMotion, IMDB, Venmo, and Reddit are the major league ones among the 100+ other medium to large scale companies. 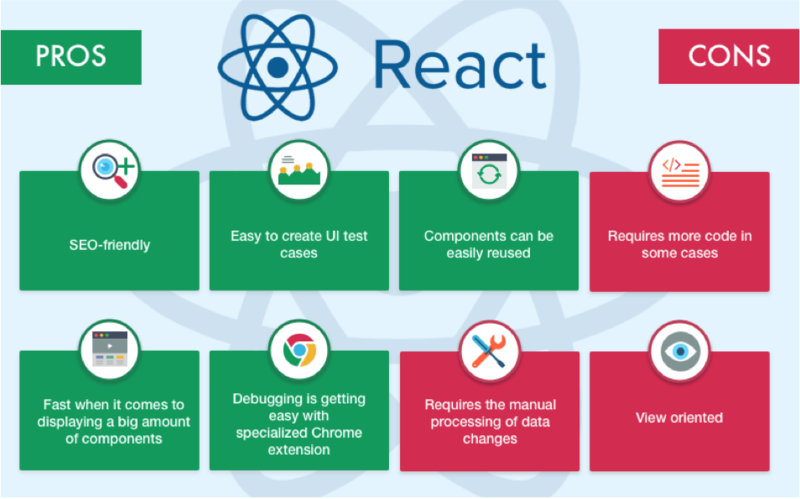 To elaborate on why businesses are converging towards this technology, we need to explore React’s primary features that facilitate the creation of high performance, agile applications, then proceed on to the pros and cons associated with using React in online businesses before finally finishing it off with a conclusion. React enables the creation of module-like pieces of code called “Components”. These code snippets reflect a particular part of the user-interface, which can be repeated across several web pages. This is what we meant by reusability, which is a great way to save valuable time on development. The declarative nature of React also makes designing UI seamless and takes a major load off from product developers so they could focus on more important functions and business logic. Considered the next biggest leap in web development since AJAX, the virtual DOM (short for Document Object Model) is the core reason why React enables the creation of fast, scalable web apps. Through React’s memory reconciliation algorithm, the library constructs a representation of the page in a virtual memory, where it performs the necessary updates before rendering the final web-page into the browser. React is a miniature library but serves multiple possible advantages to boost traction of online services and apps. The illustration below provides a glimpse of what React does well and where it falls short. We shall elaborate further on each particular element through the perspective of a business. The Virtual DOM mentioned earlier emphatically increases speed of modern web applications because it eliminates the usage of code heavy frameworks such as Jquery and other bootstrapping libraries. React itself is sufficient in creating awesome looking front-end designs and combined with its super fast rendering capabilities is a natural fit for companies to utilize it in their services. For any online business, content is king. Search Engine Optimization is the gateway to boost user traffic onto their platform. React significantly reduces page load time through faster rendering speed, adapts it performance in real-time based on current user traffic, features that are otherwise not perfectly handled by most frameworks. This particular aspect is essential for the success of businesses because faster speed is directly proportional to more users which converts to main goal of companies: Revenue. This is also emphasized by Moz in their article that effective use of SEO will improve the app’s ranking on Google search and reaching the number one spot is the holy grail of every web-based platform. When engineers and managers collaboratively decide upon migrating from an older technological infrastructure to a new one, certain questions arise on the level of effort and time required in performing the task. Google’s Angular framework; for instance, faced a very alarming compatibility issue between its first generation Angular 1.x and the futuristic Angular 2. Companies intent on shifting to the newer version, had to invest time to train developers in the latest technology. Facebook has created a dedicated debugging mechanism to isolate UI errors and bugs to the exact component causing it. The browser itself spits out relevant data about the erroneous line of code, web page and/or section to make the required correction, making lives of developers a whole lot easier. Businesses looking to create fault tolerant user interface will find ReactJS as the go-to choice. The component creation aspect of this library allows developers to efficiently perform unit testing, making sure no system crashes occur. Code reuse enables for curtailing time performing redundant tests. Adding such tests improves standards in code quality; hence, platform stability. The roadblock that developers and product managers are known to face is the limitation of documentation within React. When trying to ‘hook’ React with other libraries, two scenarios occur: Either the information provided on their forum is 1) inadequate or, 2) is not useful. Angular being a complete solution, and considering it has been around for a longer period of time, has better maintained resources and tutorials. Vue.js also, despite being new, is reliable with regard to documentation and code readability. Some experts have reservations about React’s over-dependence on external libraries to add functionality to its base. Despite being lightweight, React quintessentially is a UI library. There is only so much it can do to enhance performance and robustness of a web app through its core functionalities. Angular and Vue would be considered more extensive with regard to creating full-scale projects unlike React. GitLab cogently claims that Vue “…does not make large assumptions about much of anything either. It really only assumes that your data will change.” This is a subtle, yet critical remark on React’s superfluousness of depending on multiple libraries that may complicate matters for businesses. If we look at the whole discussion holistically, React’s advantages far exceed its disadvantages making it a robust and adaptable programming library. Companies realize React’s ability to remain relevant in the market and that is why they are investing wholeheartedly in this technology. The point; nevertheless, was to showcase the usefulness of the React library in creating modern, scalable applications. With users more quick to choose alternatives in the case of poor application performance, product developers have to make an important judgment call when deciding the ‘right’ framework for creating the best looking and performing application to drive user leads and then monetary sales, eventually. React is that library assisting companies achieve to achieve their goals, fortifying its relevance in the market for a longer time to come.